Every flock needs a good rooster. Our flock's best rooster was this rooster's father, Arturo. The rooster pictured is Newman. I have known him since his mom hid a clutch of eggs, then proudly bestowed upon us six chicks! (We collect eggs daily, otherwise we'd have a bazillion chickens). Arturo knew how to manage the flock. He knew when to break up fights between squabbling hens and other roosters. 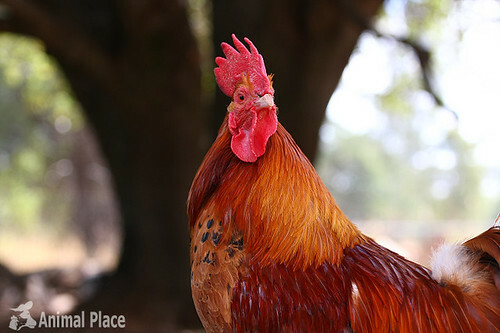 When another rooster became too aggressive with a hen, particularly while mating, Arturo was the one to interrupt and protect his flock (he did not interrupt the gentler roosters). Arturo delegated duties, making sure there was at least one other rooster or hen on sentry duty. Sometimes, he'd take up the responsibility himself. When he found good food, he always called hens over. He was kind to all the birds. I really loved him. After his death, no rooster filled his role. Chaos essentially ensued. The stability of the flock suffered with his absence. Newman has finally come into his own. He used to be a brute of a rooster. Rude, pushy, aggressive. Not with people, but his own kind. I feel like he is finally stepping into his father's tracks. He used to be very afraid of me, but now when I go into the poultry enclosure to take pictures, he follows me over to make sure I stay in line. He still has a ways to go but I'm hoping to see more of his father in him. And he takes great photos!